The interior of Bassett Hall the one-time home of John D. Rockefeller, Jr., is seen courtesy of Colonial Williamsburg. Colonial Williamsburg provided this photo of the kitchen in Randolph House. We currently find ourselves in a time where there seems to be an abundance of confusion and division, both as to who we are as a nation and who we are as individuals. Unexpectedly, I discovered insight into the past and vision for the future as I walked the footsteps of history that once helped shape the nation we are today. Pause with me, if you will. Let me take you on a step back in time — on a journey that may do more to impact your future than simply enlighten you to our nation’s past. Embark on your passage to yesteryear via the modern highways of today. 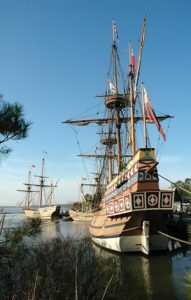 This journey to America’s Historical Triangle: Jamestown, Williamsburg, and Yorktown takes you through a region of the country that is both the hub of history and modern-day life. Among the current hustle and bustle it might appear impossible to hear the whispers of days departed — but don’t lose faith. Listen closely. Open your heart. And you will find exactly what you’re searching for — a story worth telling and a life worth living. 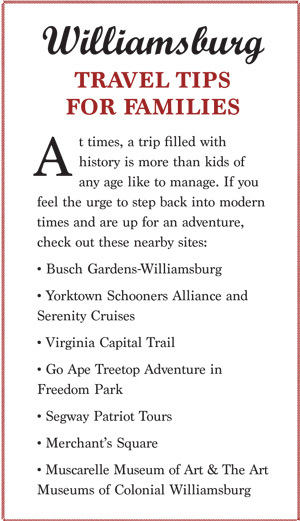 Begin by hopping on the Colonial Parkway. This 23-mile scenic roadway stretches from the York River at Yorktown to the James River at Jamestown. The National Park Service formed this roadway over the course of 27 years, beginning in 1930 and completing it in 1957, and it connects Jamestown, Williamsburg, and Yorktown. Motorists will enjoy the three-lane parkway, with a speed limit of 45 miles per hour, and find that it is the perfect way to savor the regional scenery, as well as slow your pace and mind as you prepare to walk into colonial days. Jamestown, the original site of the first permanent English settlement in America and the first stop on your journey, begins with a pause at the visitor’s center. I found this to be a critical piece to the success of my travels before embarking on the journey throughout the Historic Triangle. Here the staff and volunteers willingly answer countless questions, offer insightful wisdom based on the scope of your visit, and arrange for any tickets you may need. The sites in Jamestown vary somewhat from the other two locations in the Historical Triangle, offering a more archeological flare. Most sites date back to life in the 1600s and bestow a sense of discovery as well as mystery. Your time and historical interest will determine which spots you will want to spend your time discovering. Just a few highlights you may not wish to miss are the following: the 1607 James Fort site, an archeological wonderland that continues to unearth the “The Buried Truth” of Jamestown; the 17th Century Church Tower, the last surviving above-ground structure from the days when Jamestown was the capital of Virginia; and the Memorial Church, a beautiful indoor location patterned after churches of the 17th century. All of this walking and discovery leaves even the most avid traveler hungry, so be sure to meander over to the Dale House Café. This inviting riverside building, built in the early 20th century, offers a deli style menu and scrumptious desserts complimented by the best view of the James River for miles in either direction. The next stop on your tour is Colonial Williamsburg. From the moment you step outside of the Colonial Williamsburg Visitor’s Center, you can’t help but contemplate the brevity of life as well as the significance of one individual’s story. The walkway and foot bridge leading out from the Center focuses on important moments and individuals in American history. This sets the stage perfectly for exploring this historical setting through the filter of individual impact, and you begin to understand that although many factors vary greatly from the 17th Century colonial colony to modern day America, one thing remains — each life matters and each life has a story. An essential concept to keep in mind regarding Colonial Williamsburg is that there are numerous sites to see, experiences to encounter, tours to enjoy and events to attend. Stepping onto the streets of Colonial Williamsburg draws one into early American life, where the idea of America is still taking shape. Don your walking shoes and strike out. Chat with tradespeople and shop owners. Meet the animals. Enter their homes and shops. Hear their stories. You’ll not be disappointed if you pause to lean in and listen. Begin your journey at the Governor’s Palace, the impressive home of Virginia’s royal governors, Patrick Henry and Thomas Jefferson. Although you may walk most of the palace grounds on your own, I highly recommend the guided tour of the interior. You will experience the full grandeur of the home, its furnishings and insight into daily colonial life. As with all guided tours throughout Colonial Williamsburg, you are greeted by a tour guide that is both knowledgeable and entertaining. Fully dressed in period attire, these interpreters set the stage for a delightful and informative step back in time. Stroll off the Palace grounds and down the streets paralleling the Palace Green. Here you will find homes and colonial businesses, such as the Mary Dickinson Shop, where you can delight in 18th-century fashion. You may even stumble across educational and photographic opportunities such as oxen-pulled carts and horse-drawn carriages. Or stop to listen to a proclamation read from the Courthouse steps. Allow the dust to settle under your feet long enough to step through the doorways of a three-centuries-old church, the Bruton Parish Church. Dating from 1674, this church warmly welcomes all who enter its doors. The churchyard acclaims to have the largest colonial burial site still in existence in Virginia. The Randolph House is one stop you won’t want to miss, especially relating to modern life. This building was home to Peyton Randolph, president of the continental Congress, and his family, as well as an additional 20-plus enslaved African Americans. Hear the stories, shared intimately from the hearts of the tour guides, of differing lives comprising of freedom and slavery. Listen closely — the experiences shared still have the opportunity to shape our nation today. 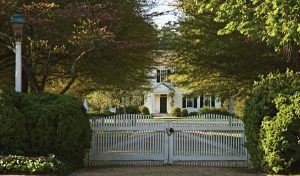 Bassett Hall, an 18th-century farmhouse in Williamsburg, Virginia, was the home of John D. Rockefeller, Jr.
During your historical visit, don’t miss the opportunity to visit the Public Hospital of 1773, the public Armoury, or the Public Gaol, the proper English word for jail. You will also want to stroll through Market Square and other period shops. A personal favorite of mine was the Apothecary, where I could catch a glimpse of how little, or just how much, medicine has changed since colonial days. Last but surely not least, your Colonial Williamsburg visit would not be complete without a stop at the Capital and Rockefeller’s Bassett Hall. Hear the principles that founded our government and rights as you walk the halls of the Capital building. Discover why Bassett Hall was one of the Rockefellers’ favorite retreats and how John D. Rockefeller Jr. was the financial power behind the Colonial Williamsburg restoration process. The final stop on your journey across America’s Historical Triangle is the scenic waterfront town of Yorktown. On the banks of the York River, the sights and sounds of history whisper through the bricks of 18th century homes and revolutionary battlefields. It is here at Yorktown, in the fall of 1781, that General George Washington surrounded General Charles Lord Cornwallis’s British army. The war ended and America’s independence was won on Oct. 19, 1781 when Cornwallis surrendered on these sandy shores. The Yorktown Battlefield is preserved by the National Park Service, and offers passes to explore the Battlefield to its fullest. Also, be sure to stop and ponder the significance of the Yorktown Monument, The American Revolution Center at Yorktown as well as a Civil War-era National Cemetery — all chronicling the history and significance of the Revolutionary War and Civil War. Whether you choose to spend an afternoon or a few days unpacking the historical and modern day gems of this town and its Riverwalk, Yorktown is enchanting. Stroll the streets in your most comfortable walking shoes, or hop on a free trolley to navigate the area. Satisfy your shopping impulses by stepping into the Riverwalk boutiques or your hunger pangs by tasting savory, local fares. Benjamin Franklin expressed in 1746 that we should “Wish not so much to live long as to live well.” Walking in the footsteps of history, through America’s Historical Triangle, you will not only discover the individuals who lived well but you will encounter a vision for the significance of your life today. Listen closely, as history breathes and whispers into your soul that you too can live a life well lived, one beautiful moment and intentional story at a time. Tania Meek spends her days as many of us do – endeavoring to balance family, faith, community and friendship, only to feel as if she might be getting it right just a sprinkling of the time.